Sometimes it takes a playful break! 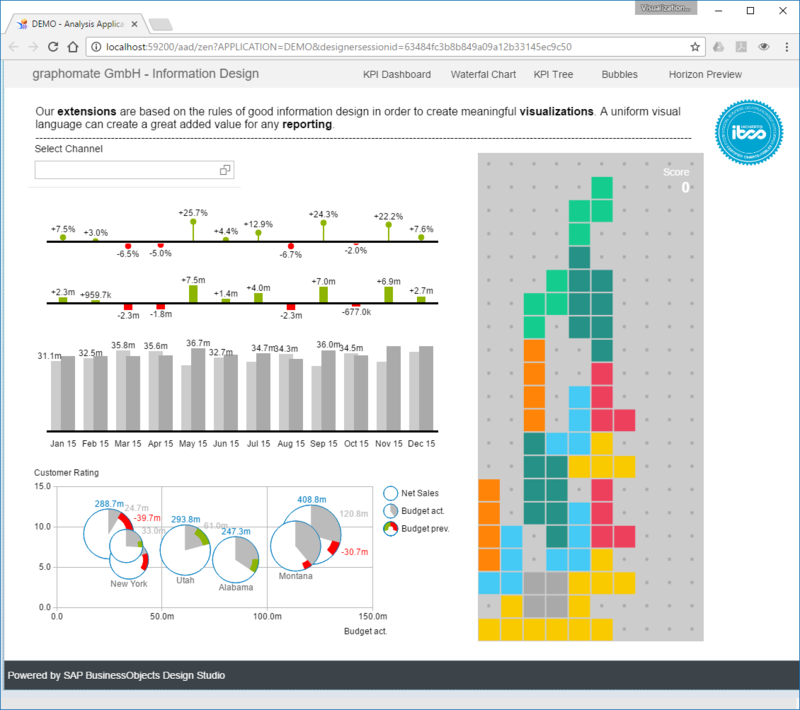 To avoid having to leave our most used Business Intelligence tool for designing IBCS-compliant reports and dashboards, we developed graphomate blocks for SAP DesignStudio. graphomate blocks is an implementation of the classic Tetris game. Tetris was invented 1984 by the Russian programmers Alexei Paschitnow, on an Electronica 60 computer. Today it is considered a computer game classic, which has now sold more than 100 million times, has received many awards and has appeared for more than 65 computer platforms. Now another platform is added. We have created our blocks is extension to make first attempts with SAP’s new product SAP BusinessObjects Lumira Designer. Lumira 2.0 is expected for mid-2017. Our customers and prospective customers can rely on the fact that our extensions are also available for Lumira 2.0 shortly after the release from SAP. graphomate blocks is free of charge and without warranty. Import the component into DesignStudio or Lumira 2.0 and create a report with our component -> finished.